For centuries, poetry has been one of the most romantic, eloquent forms of expression, and carefully chosen words can create stunning imagery and evoke intense emotions. Included in a marriage proposal, a beautiful poem can reverberate throughout a couple's engagement and marriage long after the crucial question has been asked and answered. It would be very romantic to recite one of these poems as you propose. If you're worried you'll become choked up with emotion or forget the words, you could also write one out on pretty paper, roll it up like a little scroll, and slip it inside the ring box. That way your intended would always have it as a keepsake. That I want to ask of you. Instead of "you" and "I,"
The soul to my mate. Is to say, "I do." And you know what? It's true. Until the day I met you. I know that one thing is true. And my darling, it has to be you. So what do you say; are you ready? Will you make a commitment to me? You'll never regret marrying me. But we get along great the rest of the time. But both of us know it so that's nothing new. I'm a bit of a slacker, and you're kind of a slouch. Sometimes we're both over-inclined to grouch. When you look at things this way, I'm sure you'll agree. Who else would have us without a warranty? In spite of these facts, you're still my honeybee. So let's settle for each other; say you'll marry me. Keep the vocabulary simple and easy to pronounce. Read the poem aloud and practice before the actual proposal. 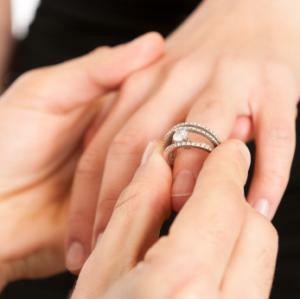 Keep the length appropriate for an easy but meaningful proposal. Use a thesaurus and other writing guides to find just the right words. Study writing before penning a proposal to have an understanding of poetic rhyme and meter. Be patient and take the time to write the best poem possible without rushing. Poetry websites and wedding planning sites often feature proposal poems. The following sources offer poems you can print for free. Famous Poetry Online: This site has many classic love poems that should provide a lot of inspiration. Poems for Free: Nicholas Gordon offers three original proposal poems on his website. Short Sweet Poems: This site features two proposal poems that are easy to memorize. Engagement Rings and Things: Here you'll find a wonderful selection of very elegant love and proposal poems. If you're looking for high romance, this is a fine source. Net Poets: This site features a proposal poem written by a modern poet. William Shakespeare: One of the most infamous playwrights and poets ever born, Shakespeare is known for his love poems Shall I Compare Thee and My Mistress's Eyes Are Nothing Like the Sun. John Keats: Keats is known for his diverse and romantic works, and one of Keat's best loved romantic poems is Bright Star. Robert Burns: Scottish poet and lyricist Robert Burns penned the famous A Red, Red Rose. Henry Wadsworth Longfellow: This well-known and often studied influential poet has a broad range of works. His poem The Arrow and a Song is a beautiful example. John Milton: Known for his epic Paradise Lost, this accomplished scholar and poet wrote rich, dramatic verse. Robert Browning: Browning wrote many short poems and is known for dramatic monologues. Meeting at Night is an example of his romantic works. Length: Very long poems can become tedious as the heart beats faster during a proposal, and if the poem is being recited, a long verse can be harder to remember when nerves begin to burn. Shorter poems can be more powerful than longer epics, and even a short verse can be personalized with endearing words and the classic "Will you marry me?" Type: For some couples, the most romantic type of poetry is a highly structured sonnet, while other couples may appreciate less formal verse. Choose whatever feels most natural to you. Imagery: Every word in a poem is meaningful and symbolic and choosing just the right imagery can be powerful for a marriage proposal. The imagery may be related to the proposal itself such as tropical images for a beach proposal, or it may be related to significant events and locations in the couple's courtship. Source: Consider selecting a romantic verse or two from a favorite poet or poetry anthology book. Once you have your poem, the next step is figuring out how you'll use it. There are many ways you can work the poem into the big moment, including the following suggestions. Declare love for your intended and then recite the poem before getting down on one knee and proposing. Create a scrapbook of special photos of happy memories together. 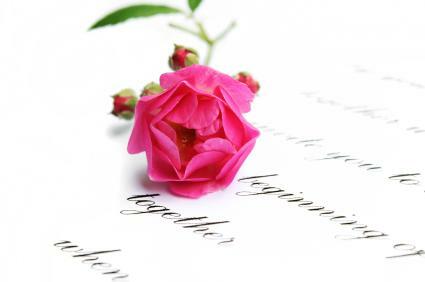 Write the poem that proposes marriage on the last page of the scrapbook. Another variation is to write a few lines of the poem on each page of the scrapbook and conclude with the big question on the last page. Engrave a short line from a favorite poem in the engagement ring band. This only works if the band is wide enough for an engraving. Burn a CD of special romantic songs and include a recitation of the poem. Listen to the CD together and surprise her with the proposal. After she listens to the proposal, get down on one knee and propose. Anyone can pop the question, but it takes a special person to put so much care into a marriage proposal. If you choose the right poem, its delicate verses and eloquent words can become the perfect precursor to those all-important wedding vows.